You can learn a wide range of fundamentals of robot production such as artificial intelligence, microcomputer, mechanical, and electricity. 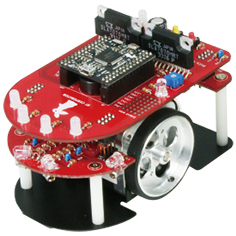 Pi: Co CLASSIC3 is an assembly robot kit designed in accordance with the Micro Mouse Classic standard. Kit comes with a basic knowledge-based instruction manual composed of a lot of photographs and a detailed explanation. You can learn from the fundamentals of programming to the algorithm for the maze capture step by step. You can start the assembly of the robot after getting accustomed to soldering. Pi:Co Classic3 can be assembled cleanly because the parts are packed in order. This robot is movable by programming along the manual and is possible to learn the robot technology with itself. Maze is made up of pillars, walls and bases. Maze is the same specification as the official standard, it is ideal for the adjustment of the mouse. Please inquire about the price and the details. Pi:Co Ciassic3 manual.Only Japanese manual is provided & Sample program.